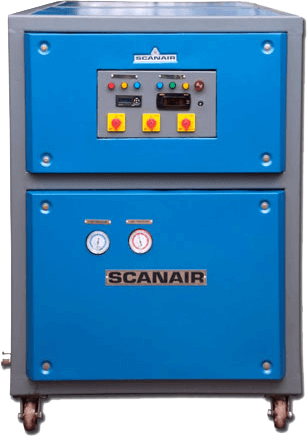 Scanair Water chillers in Hyderabad offered power efficient Water chilling plant Dealers through Andhra Pradesh, Telangana, Hyderabad, Visakhapatnam Vijayawada, Amravati, Kakinada, Nellore, Guntur, Tirupati, Rajhmundry, Srikakulam, Nizamabad, Kurnool, karim nager. Water chillers will maintain the Temperature range from 5˚ C To 30˚ C ± 1˚ C capacity from 450 Kcal/Hr to 150000 Kcal/Hr, 3 LPM to 650 LPM with different flow capacity. Water or other liquid from the chiller is pumped through process or industrial equipment specially for the plastics industry uses process chillers to reduce cycle times in injection molding and blow molding by regulating temperatures. Scanair Water Chillers ideal and most suitable for a wide spectrum of applications in Hyderabad, Visakhapatnam Vijayawada, Amravati, Kakinada, Nellore industries like, Plastic Injection Molding and extrusion, Pet Blowing, Film Blowing HDPE, LDPE, Pouch sealing Machines, Lamination Machines, Aluminum Die Casting, Laser Welding, Ultra sonic Welding, Induction Hardening Machine etc., those applications need to be cooled in presided temperature to reduce the cycle time and product quality, productivity. 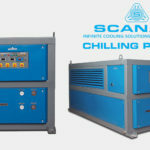 Plastic Injection Molding chillers, Pet Blowing chillers, Laser Cutting & Welding chillers, Lamination chillers, Aluminum Die Casting chillers are designed new generation styled and built aesthetically to match the modern trend in equipment manufacturing.